Like to learn more about a Payday Loan in Leesburg? You’ve come to the right place. Some people call it a Payday Loan. Here at Amscot, we call it an Amscot Cash Advance*. Why is that? Because here, when you get approved for a cash advance, you get exactly that – cash! If you live in Leesburg and you’re considering a Cash Advance, you can trust Amscot to keep the process simple and convenient. 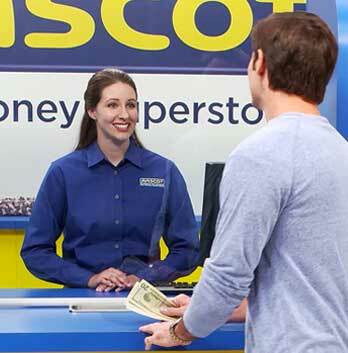 With an Amscot Cash Advance you could get up to $500 in minutes with no credit checks! Not only is an Amscot Cash Advance (Payday Loan) fast and convenient, it often costs less than late fees on an overdue bill. Below you’ll find additional links to help you learn more. Or, simply click the "Get Started" button on this page. Why do so many residents in Leesburg prefer an Amscot Cash Advance? There are No Credit Checks. Our quick approval process can put cash in your hand within minutes. Amscot has some of the lowest Payday Loan fees in the industry. View APR/Fee Schedule. We’re open 365 days a year, and some locations are open 24 hours. Amscot is licensed by OFR, and regulated by state and federal laws. How does an Amscot Cash Advance work? Complete our short application, sign an agreement, and write a check for the payday loan amount plus the fee. Then you’ll receive cash on the spot and we’ll hold your check until your next payday when repayment is generally due. It’s that simple, and Amscot charges a flat, one-time fee for its service. Like to learn more information about Amscot Cash Advance? Compare the savings! Amscot Cash Advance vs a bounced check. Fee: $12.00. $12.00 fee equals 10% of the amount advanced plus a $2.00 verification fee per transaction. Fee: $54.00. Source: CFSA 2006 National Fee Survey from National Data on Short-Term Credit Alternatives. See cfsa.com for more information. Annual Percentage Rate (APR) for the cash advance example is 312.86% assuming a 14 day hold period. At Amscot, we provide a wide array of convenient financial services to our customers including check cashing, free money orders, and cash advances (often referred to as a payday loan). You can pay your bills electronically, wire money, send a fax, make copies, buy stamps, and use a well-lit, accessible ATM inside the branch. You can even obtain and load an Amscot Prepaid Mastercard. Need something notarized? We do that too! Each branch is open 7 days a week from early to late - with many 24-hour locations to serve you. Amscot is regulated by state and federal laws. We operate only in Florida, a state with some of the strictest consumer-protection laws in the United States and have many convenient locations to serve you. Amscot is a member of and adheres to the "Best Practices" of the Community Financial Services Association of America ("CFSA"). Pursuant to a provision of the federal law and as a member of the CFSA, Amscot cannot offer you a cash advance if you are an active member of the military or his/her spouse or dependent. For more information related to this law please click here. *You must be 18 years or older, a Florida resident, and you cannot have any outstanding cash advances with Amscot or any other provider. Some restrictions apply. Getting started online by clicking the Get Started Now button does not constitute an online application, to apply you must come into an Amscot branch location. If your check is dishonored a return check fee and non-sufficient funds fees may apply. As a member of CFSA, Amscot abides by the Fair Debt Collection Practices Act, as applicable, to collect past due accounts. Non-payment does not affect your credit score. Amscot does not offer automatic renewals. APR 271.14% to 365.00%. APR example provided is representative range based on a fourteen (14) day hold period with one payment. Amscot is licensed by the Office of Financial Regulation pursuant to Florida law governing Money Service Businesses. CUSTOMER NOTICE: There are a wide variety of loan products available in the marketplace, so your choice of lending products should match your financial needs. Small-dollar loans used over a long period of time can be expensive. Sign up for email updates and be the first to know what’s new at Amscot. From timely product information to new branch openings & special offers. © 2013 - 2019 Amscot Financial, Inc. All Rights Reserved.